On his critically acclaimed 2001 album The Blueprint, Jay-Z rapped, "Scramble like Randall with his/Cunningham, but the only thing running is numbers fam." Amongst the wide sea of sports references in hip-hop music, this potent punchline may stand as one of the most accurate of them all. 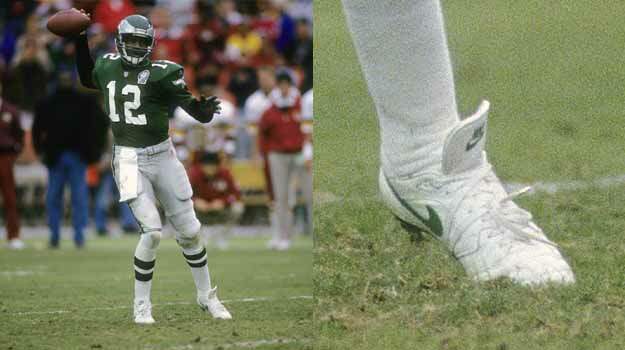 During his prime years with the Philadelphia Eagles from 1985 to 1995, Randall Cunningham was one of the best scrambling QBs the game had ever seen. His ability to put up above average rushing yards and maintain a strong passing game made Cunningham one of the best quarterbacks of his era, and this unique playing style helped to paved the way for future QBs like Michael Vick. On October 18, 1992, Randall Cunningham solidified his spot in history during a Philadelphia loss to the Washington Redskins. During the game, Cunningham ran for 39 yards, which put him past Fran Tarkenton&apos;s previous record of 3,674 rushing yards for a quarterback. After retiring and then returning to pro action for 4 more years, Randall Cunningham finished his career with 4,928 yards. Eventually, this number was surpassed by the aforementioned Michael Vick, who currently has a career total of 5,858 rushing yards and leads all quarterbacks.